Be the first to share your favorite memory, photo or story of Thelsa "Tt". This memorial page is dedicated for family, friends and future generations to celebrate the life of their loved one. Thelsa Faye “Tt” McInnis Savell died March 13th with her family by her side in Ocean Springs, Mississippi. Mrs. Savell was born in 1946, in Hattiesburg, MS. to D.C. and Arlene McInnis. Thelsa began her teaching career in Hattiesburg, MS before moving to Gautier with her husband Rob where she retired from College Park Elementary after 25 years of teaching 6th and 2nd grade. 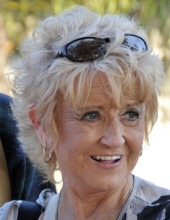 Thelsa lived her entire life in South Mississippi and is survived by her husband of 48 years, Rob; brother Jake McInnis; son Robbie; and grandchildren Marleigh and Tyler Savell. Service will be held March 18, 2019, at 11:00 a.m. at the First United Methodist Church of Gautier.2717 US-90, Gautier, MS 39553. In lieu of flowers, the family has requested donations be made to St. Jude Children’s Hospital or Jackson County Animal Shelter. To send flowers or a remembrance gift to the family of Thelsa "Tt" Faye Savell, please visit our Tribute Store. "Email Address" would like to share the life celebration of Thelsa "Tt" Faye Savell. Click on the "link" to go to share a favorite memory or leave a condolence message for the family.